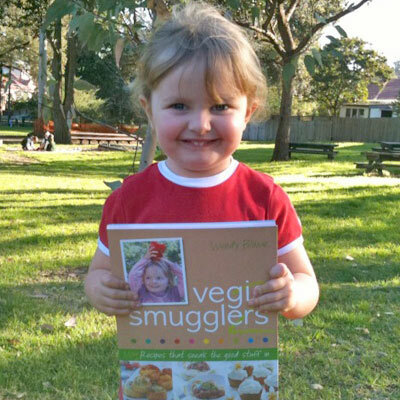 We’re almost there… Vegie Smugglers 2 unveiled! The lovely Miss R is pretty pleased with seeing herself on the cover! Unlike the uber-fast, instant-gratification, blogging world, creating a book can be a frustratingly slow process. There’s the photography (done in my kitchen), the writing and design (done at the dinner table), two rounds of editing (by the gorgeous Mel) and then the printing (I actually pay someone else to do that!) and then I wait for the final product. And so it has been that the second installment of the Vegie Smugglers cookbook has been simmering away for the past year and a half. It starts of with lots of trial recipes. Lots of thumbs down from the kids and stoic silences from my best friend as they are subjected to various experimental recipes. Gradually dinners improve and by round 3 they are ooohhhing and aaaahhhing over them and I’m feeling quite pleased. I’ve usually photographed them along the way and the pages get laid out one by one and the excitement grows. For this book I enlisted a team of recipe testers to help me out. Their feedback was fantastic. It means that this book has had fresh eyes helping to question and clarify the recipes. I’m confident that anyone who enjoyed cooking from book 1 will be thrilled with book 2. So stay tuned…. I should have it on sale by the middle of September. Can’t wait! congratulations on your superb achievement. Congratulations! And Miss R is such a cutie. Ooh I can’t wait! Book one has been a hit so far!